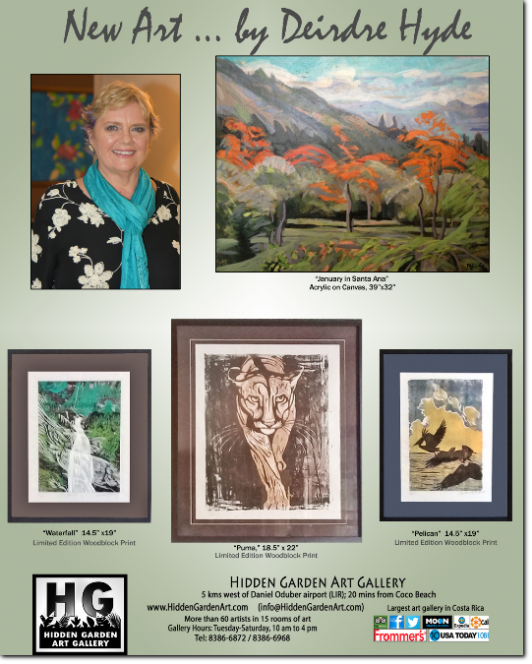 An interpretation consultant for World Wildlife Fund and International Union for Conservation of Nature, artist Deirdre Hyde has worked throughout the Americas, Europe and Africa. As part of this work she produced of an impressive body of nature illustrations that have been displayed in and reproduced in publications from Norway to Brazil, while tirelessly continuing her practice as a fine artist. Trained in fine art at Reading University (United Kingdom), Hyde's work is found in private and public collections worldwide. Hyde's main influences are renowned British artists and figurative painters Ray Atkins, Frank Auerbach and John Wonnacott. Inspired by adventurous practise of Maria Sibylla Merian, Margaret Mee and Marianne North, to name just a few, Hyde dedicated her talents to the interpretation of nature for the National Parks of Central America. Light and water provide the emotional charge to these monumental yet nuanced landscapes. Her contemporary mix of wry wit and celebratory images encompasses everything from classical sculpture to urban landscape in a poetic vision that transforms the mundane into the magical. People are portrayed suspended in a moment of awakening, caught in either air or water, in the off-balanced flow. A hint of the ominous often encroaches on the ecstatic. Most recently Hyde has created a 130 meter long mural for Frank Gehry’s Biomuseo (Museum of Biodiversity) in Panama and is now exhibiting at the Hidden Garden Art Gallery. Watch the slide show from Deirdre's opening here. Read more about Deirdre in A.M. Costa Rica.